"Run Like a Girl" is the slogan that NYRA marketing officials are using to promote Rachel Alexandra's appearance in the Woodward Stakes on Saturday. Attendance and handle are slightly down and the superstar filly represents the last hope that the track has for getting even on the year with last year. The unofficial over/under on the anticipated attendance for Saturday was set at 24,000 over bites (pun) of lasagna and brazziole at Allan and Phyllis Crocker's home on Fifth Avenue. As one dinner guest, the husband of a woman whose Dad owned a Kentucky Derby winner, remarked "Saratoga has more racing fans than New York. I'll take a little action of that on the high end." Curlin was recruited to boost attendance at last year's Woodward. Nonetheless, the reigning Horse of the Year produced only 22,572 fans, below expectations. In any case, Rachel Alexandra's feminine status in a race ordinarily contested by males might result in a larger rooting interest. By playing the gender card, NYRA may see the crowd top 40,000. Two minor stakes races highlighted Wednesday's program, the first day of racing in the last week of the 2009 meet. The fourth race, a six furlong dash for fillies and mares, was named the Loudonville Stakes. JZ Warrior tried to atone for her second place finish in the recent Addison Mallery Stakes. But the favorite Simplify beat her. The ninth race, the Lena Spencer, was slightly shorter in length and grassier than the Loudonville, but otherwise the same. Spencer was the founder of the coffee house Caffè Lena, a Saratoga Springs institution on Phila St. Bob Dylan, at age 21, played for Skidmore girls and their beatnik boyfriends here in ‘61. Linda Rice, attempting to become the first woman to win a trainer's title at Saratoga, entered three horses in the 5 ½ furlong turf sprint and in the end started two. Of the two that she started, Canadian Ballet triumphed. NYRA's decision to relax the quality standard of Saratoga races to assure bigger betting fields backfired when four horses scratched and only three horses ran in the third, a $20,000 claiming event. Headache and Matador Run ran together head-to-head for awhile as if in a match race and then Headache ran on ahead. David Jacobson claimed him. 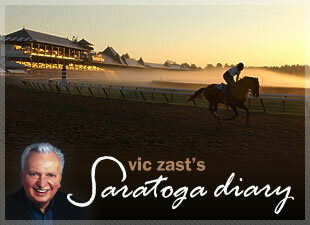 Wednesday's card produced another small crowd - that is, small by Saratoga standards. It was "Proud to be an American Day" and members of the armed forces, both past and present, were admitted free. Miss America 1998 Kate Shindle sang the national anthem. On Thursday, 15 lucky fans will win $1000 betting vouchers to use until the place closes down for the fall, winter, spring and early summer. Imagine what horseplayers that have been frustrated for the past 32 days could do with that.